Sebastien Ogier leads Thierry Neuville at the head of the Monte Carlo Rally order, but Ott Tanak dropped out of the fight on Friday afternoon after picking up a puncture.Ogier, who is making his first World Rally Championship start since returning to the Citroen fold, started the afternoon loop 3.4 seconds behind Neuville and should have fallen further behind his rival on the icy Valdrome-Sigottier test. 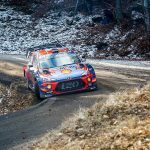 But Neuville carried too much speed into a bend near the start of that stage and had to take to an escape road, which left him close to 20s behind Ogier at the first split. 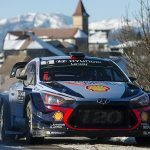 The Hyundai driver was able to limit his time loss to two seconds to stage winner Ogier come the end of that run but, with more slick tyres at his disposal, Ogier hammered home his advantage on the following stage – the 14.94-mile Roussieux-Laborel test – to move into a lead of 14s. 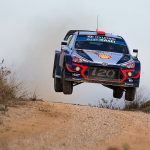 Neuville – who profited from a bold tyre selection of his own in the morning – clawed back a huge chunk of that time by recording a second stage win of the weekend on the day’s final stage but will start Saturday morning’s loop two seconds behind six-time champion Ogier. 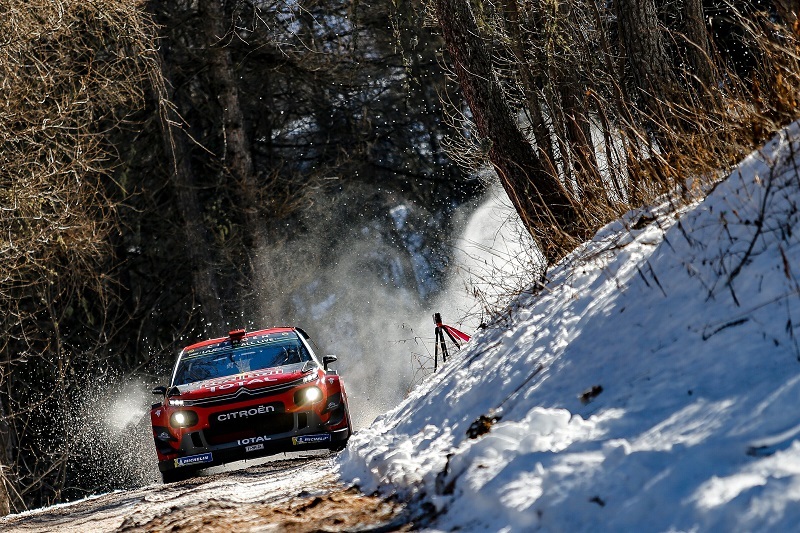 Toyota driver Tanak, whose team principal Tommi Makinen hit out at officials over stage issues in the morning, dropped away from the two leaders on the opening stage of the afternoon but held a comfortable third. But the overnight leader then suffered a puncture on SS7 that he was forced to change on the stage, which cost him 2m20s and dropped him to seventh overall. 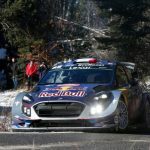 He was back up to speed on the day’s final stage, finishing second to Neuville, but is more than 45s behind the M-Sport Ford Fiesta of Elfyn Evans, who holds sixth. 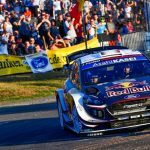 Tanak’s tumble allowed Sebastien Loeb to briefly move into third when he claimed his second stage victory of the day on SS7 – the repeat run of Roussieux-Laborel, which he won in the morning – after once again opting for a generous selection of slicks. But Loeb, making his first start in Hyundai colours, was only seventh fastest on the final stage of the afternoon and dropped back behind Andreas Mikkelsen (Hyundai) and the Toyota Yaris of Jari-Matti Latvala. Mikkelsen has an advantage of 7.4s over Latvala, while nine-time WRC champion Loeb is just 0.8s further back. The final WRC car still running by the end of the afternoon loop was Kris Meeke’s Toyota, but a wheel-rim issue on the penultimate stage cost him more than three minutes in one hit. Meeke had worked his way up to sixth after the first stage of the loop, but the wheel issue dropped him out contention for a strong finish – the Northern Irishman is now more than three minutes behind seventh-placed Tanak. M-Sport driver Pontus Tidemand retired after breaking a wishbone on SS6, while Citroen’s second driver Esapekka Lappi broke his driveshaft and a wishbone of his own on the same stage and will restart on Saturday. Top 15 classification after SS8 at Rallye Monte-Carlo, the first round of the 2019 World Rally Championship. 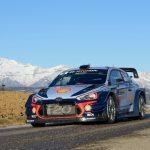 MONTE CARLO: SÉBASTIEN OGIER HALVED HIS DEFICIT TO RALLYE MONTE-CARLO LEADER THIERRY NEUVILLE IN FRIDAY AFTERNOON’S OPENING SPEED TEST.